As with this recent statement from Mr. Swetnam, independent reports of very large areas burned are coming in, but the Russian government has yet to confirm them. However, even though no clear numbers are yet available, both NASA’s satellite data and reports coming from far flung regions are startling. As recently as last week smoke from the fires had traveled as far as Canada. That’s right, the massive volumes of smoke from these blazes had entered the Jet Stream and been deposited in many of Canada’s valleys. A news report from Okanagan noted that a lingering smog had settled over much of the land there. Okanagan is on the west coast of the North American continent. So for the smoke to have reached it, it must have traveled thousands of miles. Okanagan isn’t far north of Seattle, so Washington may also get a whiff of the massive blazes taking place in Siberia. In general, the size of these fires, the range of the smoke coming from them, and the fact that researchers are noting that the cause and scope of these fires is startling, bears watching. It is not a happy prospect, but considering their proximity to Arctic methane sources and other Arctic carbon pools, these fires seem to be just one more amplifying feedback in a growing list. Another unsettling prospect is the general lack of news coverage from mainstream media on these fires. Most reports are coming in from local sources, so one has to put together a patchwork of scattered references to get a decent context for what is actually happening. Considering the scope, location, and timing of these fires in conjunction with major droughts and Arctic sea ice melt, it would seem a very important topic to cover. One can only hope for more clarity in the coming days and weeks. 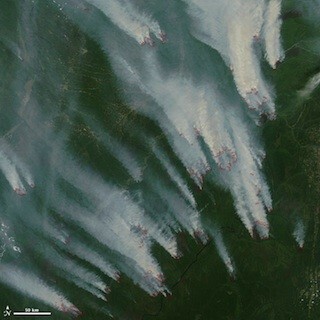 Meanwhile, based on the most recent reports, large fires are still underway in Siberia. Will do my best to keep you guys posted.